4. ICLLM kongresi bildiri ödülü sahipleri ve poster özetleri aşağıda yer almaktadır. Katılımcıları tebrik eder, başarılarının devamını dileriz. Objectives: Hodgkin lymphoma (HL) is characterized by CD30-positive Hodgkin Reed-Sternberg cells. The standard of care for pts with relapsed/refractory (RR) HL is salvage chemotherapy followed by autologous stem cell transplant (ASCT). However, around 50% of pts relapse after ASCT. Brentuximab Vedotin (ADCETRIS®), an anti-CD30 antibody conjugated by a protease cleavable linker to a microtubule disrupting agent, monomethyl auristatin E (MMAE), induces apoptotic death of CD30-expressing cells by binding, internalizing and releasing MMAE. A pivotal phase 2 study was conducted to determine the efficacy and safety of Brentuximab Vedotin in 102 pts with RR HL following ASCT (NCT00848926). Long-term survival data from this ongoing trial are described. Methods: Pts received 1.8 mg/kg Brentuximab Vedotin Q3wk as a 30-min IV infusion for <=16 cycles. Primary endpoint: objective response rate (ORR) per independent review. Long-term follow-up assessments to determine survival and disease status: every 3 mos for 2 years, every 6 mos during years 3 to 5, then annually. Results: Median time to relapse after ASCT was 6.7 mos (range, 0–131). Pts received a median 9 cycles of Brentuximab Vedotin. The ORR was 75% (76/102 pts), with complete remissions (CRs) in 34 pts (33%). At time of analysis (July 2012), the median time from first dose was 29.5 mos (range, 1.8–36.9). 60/102 pts (59%) were alive at the time of last follow up and median overall survival (OS) has not been reached. The estimated 24-mo OS was 65% (95% CI: 55, 74). The median OS by best clinical response was 31.6 mos for pts with partial remission (PR, n=42), 20.6 mos for pts with stable disease (SD, n=22), and 10.2 mos for pts with progressive disease (PD, n=3); median OS for pts with CR (n=34) has not been reached. Evaluation of demographic and baseline characteristics found that pts with a baseline ECOG score of 0 were the only subgroup with a significantly more favorable OS following Brentuximab Vedotin treatment (24-mo OS: 81% vs. 47% for ECOG scores of 0 vs 1, respectively). There was no significant difference in OS fo pts who had relapsed within a year of ASCT compared with pts relapsing >1 year after ASCT. The most common (>=15%) Brentuximab Vedotin-related AE of any grade: peripheral sensory neuropathy, nausea, fatigue, neutropenia and diarrhea. AE Grade >=3 occurring in >=5% of pts: neutropenia, peripheral sensory neuropathy, thrombocytopenia and anemia. Conclusions: After a median observation time of approximately 2.5 years, 60 of 102 pts (59%) were alive at the time of last follow up and the median OS has not been reached. The estimated 24-mo OS was 65%. Baseline ECOG score of 0 was the only pretreatment factor associated with a higher 24-mo OS. Treatment with Brentuximab Vedotin in pts with RR HL following ASCT is associated with prolonged OS compared with historical control pts.1 Brentuximab Vedotin is under evaluation as front line therapy for adult pts with advanced classic HL. The Src family kinases (SFKs) are important intracellular tyrosine kinase signaling mediators that transmit signals from cell surface receptors and are involved in diverse physiological processes as well as many human malignancies. The SFK, Lyn, Blk and Fyn are known to play a critical role in B-cell development upon B-cell receptor (BCR) crosslinking by inducing phosphorylation of many different downstream targets thereby promoting cell growth and differentiation (Fig. 1). Objective: Quantification and analysis of the protein tyrosine kinase (PTKs) expression in childhood acute lymphoblastic leukemia (ALL) and ALL cell lines and functional assessment of their potential role in leukemogenesis. Method: Whole cellular lysate from bone marrow (BM) or peripheral blood (PBL) from primary ALL patients and ALL cell lines were analyzed. Detection of the expression and phosphorylation state of PTKs at the protein level was performed by Western Blot. Modulation of the BCR signalling network by using shRNA mediated repression of the predominant PTK Lyn, in the Nalm6 cell line was carried out. Analysis of cell proliferation and apoptosis was monitored by MTT assay and Anexin V/PI staining, respectively. Results: TK expression in ALL patient samples is characterized by a high degree of heterogeneity and does not correlate with the immunophenotype of ALL. However, unsupervised hierarchical cluster analyses led to the identification of a subgroup of patients showing a relatively high Lyn expression. The Nalm6 cell line was chosen as a model which mirrors Lyn expression status in ALL patients. Tyrosine phosphorylation pattern was greatly diminished in Nalm6 upon Lyn depletion, furthermore the Lyn-depleted cells showed a substantially reduced cell proliferation and preliminary increased apoptosis. Conclusion: Our findings indicate that aberrant expression of Lyn in ALL may contribute to cell proliferation. Although we have highlighted substantial contribution of Lyn in cell proliferation in leukemic cells, the impact of combining drugs targeting Lyn with conventional chemotherapeutics agents remains to be determined. Activation of the pre-BCR signalling leads to a single tyrosine phosphorylation at the immuno-receptor tyrosine-based activation motif (ITAM) (red dash) in the cytoplasmatic portion of Igα, followed by the recruitment of SFK members like Lyn, Blk, Fyn. Subsequently, the Igβ-ITAMs are double phosphorylated in a SFK dependent manner, then Syk is recruited to the ITAM, where it plays an essential role in proliferation and differentiation1. 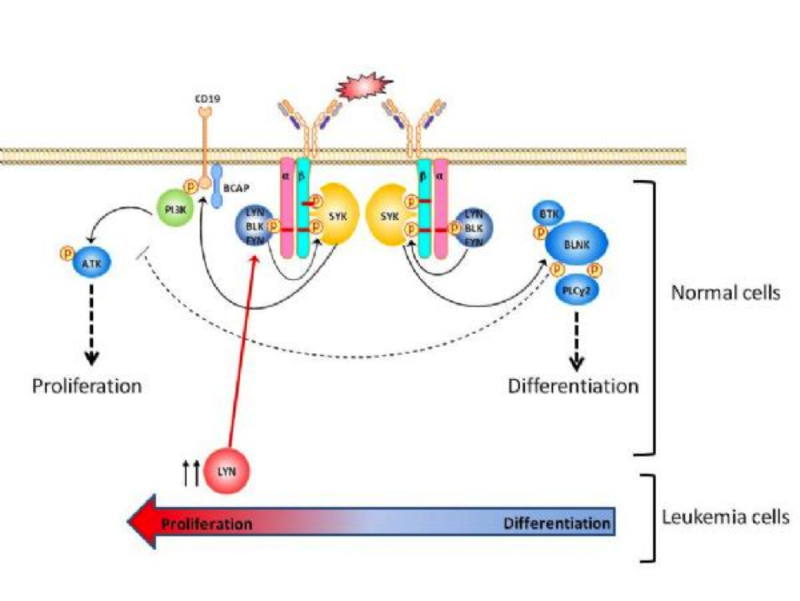 Contrary, leukemic cells have shown an impaired differentiation2 accompanied by an increased proliferation3. The observed high expression levels of Lyn in ALL cells may substantially increase cell growth suggesting a potential advantage of using Lyn inhibitors in addition to anti ALL chemotherapy-drugs. To date one of the major challenges in Chronic lymphocytic leukemia (CLL) is to identify genes responsible for the progression of the disease and functionally characterize them. We previously found that the miR-181b significantly decreases during the progression of CLL as specific effect and its expression inversely correlated with protein levels of the anti-apoptotic target genes MCL1 and BCL21. Based on our data, we aim at identifying the stimuli that regulate the expression of miR-181b and other miRNAs involved in the progression of the disease, such as the miR-181a and the miR-130a. Progression of CLL is characterized by gradual reduction of the ratio T/B cells, along with immune cell dysfunction due in part to the T cell defects, such as decreased expression of CD40L and reduced signaling via the TCR CD3. This compromise the ability of T cells to eliminate leukemic cell from CLL patients. Since enhanced activation of either the allogenic or autologous T cells can drive the death of CLL cells in vitro and in few human subjects2-3, we speculate that this death is due, at least in part, to increased expression of the 3 miRs in B cells. To investigate the effect of T cells on the expression of the candidate microRNAs, we co-cultured allogenic pure CLL-B cells with either activated (CD2, CD3 and CD28 antibodies, used to mimic antigen-presenting cells) or not activated CD4+ T cells from healthy donors. We observed a significant increase of mir-181b/a and miR-130a expression in CLL B-cells after co-culture with activated CD4+ T cells in 8 out of 11 cases. A significant increase of these miRs was also determined in purified CLL B-cells after 4 days activation of peripheral blood mononuclear cells (PBMCs) from CLL patients, even if in minor rate. By the use of specific antibodies, co-culture with Hela CD40 expressing cells and transwell experiments, we established that this effect is a T/B contact-dependent signal mediated through CD40L-CD40 interaction. In conclusion, our preliminary data show that an efficient activation of CD4+ T cells through CD3-complex pathway and a right CD40L-CD40 interaction lead to a significant increase of the candidate miRs, which are extremely down-regulated in the disease. These findings open up the possibility of intervening in the management of CLL patients through the restoration of the activity of the miR-181b and consequently the decrease of the protein levels of the anti-apoptotic MCL1 and BCL2 genes, thereby reestablishing, at least in part, a proper apoptosis rate of the CLL B-cells. 1.Visone R., et al. (2011). miR-181b is a biomarker of disease progression in chronic lymphocyticleukemia. Blood. Sep 15;118(11):3072-9. 2.Bonyhadi, et al. (2005). In vitro engagement of CD3 and CD28 corrects T cell defects in chronic lymphocytic leukemia. J Immunol 174, 2366-2375. 3.Porter, D.L., et al. (2011). Chimeric antigen receptor-modified T cells in chronic lymphoid leukemia. N Engl J Med 365, 725-733. Activation of T cells from healthy donors increase the expression of the miR-181b and miR-130a in B-CLL. 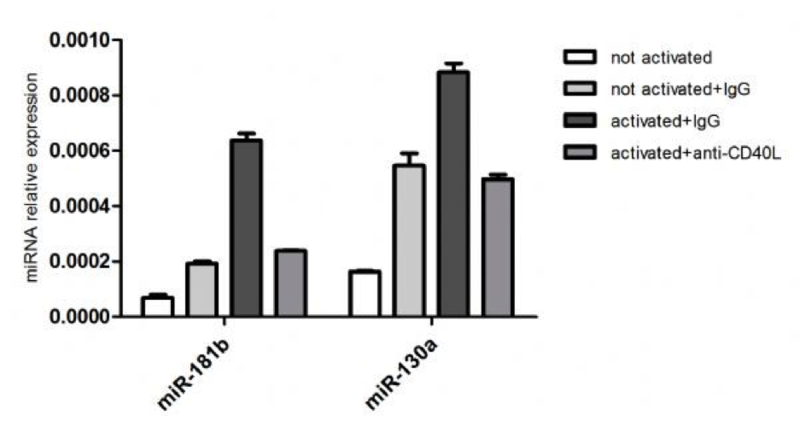 MiR-181b and miR-130a expression in purified B-CLL cells after 24hrs of co-culture with either activated or not activated T cells from healthy donors in presence of either the blocking ab-CD40L or the control IgG. Ratio was 1:1 for T:B cells. The expression has been determined by stem-loop real-time qPCR. Each sample of data was normalized to the endogenous reference RNU44 with the use of the 2-Δct method. Aim: Acute myeloid leukemia (AML) is a heterogenous disease in which leukemic blasts proliferate and invade healthy bone marrow. It makes 15 to 20 % of childhood acute leukemias. Recent developments in both the chemotherapeutic regimens and supportive result in a better survival in children with AML. We evaluated the 192 Turkish children with AML treated in 23 different centers, and received AML-Berlin-Munster-Frankfurt (BFM) protocol. Patients and Methods: We retrospectively evaluated the medical records of the children with AML, who received AML-BFM regimen, and analysed the data gathered from different centers. Results: Mean age of the patients were 8.7±7.9 months (10 days–17 year), and male/female ratio was 1.4. The most common French-American-British subgroup among the patients with a known subgroup was M2 with a frequency of 31.3%. Complete remission rate was 98.4%. Eleven percent received hematopoetic stem cell transplantation. Overall survival and event free survivals were 58.8 and 58.4 % respectively. Among them 29.2% died. Infection (57.7%) was the most common cause of death, followed by relapse, resistant disease, and hemorrhagy. Conclusion: Although our patients have a high rate of complete remission, overall and event free survivals were similar to previously reported results. Since the most common cause of death was infection, a standardized and good supportive care plan may improve survival or the patients. Background: Cardiotoxicity is a potentially serious complication of anticancer therapy that can significantly impair patient’s quality of life. The greatest risk for development of cardiotoxicity is represented by anthracyclines (ANT) and high-dose chemotherapy (HD-CT). Various methods including cardiac biomarkers have been recommended for monitoring of cardiotoxicity in oncology. Objectives: The aim of our study was to assess cardiotoxicity of conventional and HD-CT with multiple biomarkers of cardiac injury – glycogen phosphorylase BB (GPBB), heart-type fatty acid-binding protein (H-FABP), cardiac troponins (cTnT, cTnI), creatine kinase MB (CK-MB mass), myoglobin. Methods: A total of 47 adult acute leukemia patients were studied – 24 patients treated with conventional CT containing ANT (mean total cumulative dose 463.2 ± 114.3 mg/m2) and 23 patients treated with HD-CT (myeloablative preparative regimen Bu/Cy2 or Cy/TBI) followed by stem cell transplantation (SCT). All patients had normal liver and renal functions during the study. Cardiac biomarkers were measured prior to treatment (before CT/HD-CT), after first CT with ANT, after last CT with ANT in the first group; after HD-CT and after SCT in the second group. Cardiac biomarkers were measured on Evidence Randox (GPBB, FABP, cTnI) and Elecsys Roche (cTnT, CK-MB mass, myoglobin) analyzers. Values above the reference range recommended by the manufacturers were considered elevated. Results: Before CT/HD-CT, all biomarkers of cardiac injury were below the cut-off values in all patients. GPBB increased above the cut-off (7.30 µg/L) in 4 (16.7 %) patients after first CT and in 5 (20.8 %) patients after last CT with ANT. GPBB increased above the cut-off in 5 (21.7 %) patients after HD-CT and remained elevated in 5 (21.7 %) patients after SCT. CTnI became elevated (above 0.40 µg/L) in 2 (8.3 %) patients after first and last CT with ANT. Both patients with cTnI positivity had elevated GPBB. Other tested biomarkers (H-FABP, cTnT, CK-MB mass, myoglobin) remained below the cut-off values during the study. Conclusions: Our results suggest that GPBB could become a sensitive biomarker for detection of acute cardiotoxicity associated with conventional CT containing ANT and HD-CT followed by SCT. The predictive value for development of cardiomyopathy in the future is not known and will be evaluated during a prospective follow-up. Based on our data, a larger prospective and multicenter study would be most desirable to define the potential role of new biomarkers in the assessment of cardiotoxicity in hematooncology. The work was supported by a long-term organization development plan 1011 (FMHS).